Los Angeles, December 6, 2018 – CBRE Group, Inc. (NYSE:CBRE) today announced that it has agreed to form a joint venture with Excellerate Property Services (Excellerate) to meet the growing demand for high-quality real estate services in Africa and the Middle East. With the formation of the joint venture, Excellerate will end its affiliation with Cushman & Wakefield. Excellerate will work closely with Cushman & Wakefield to ensure continuity of services for existing client assignments. 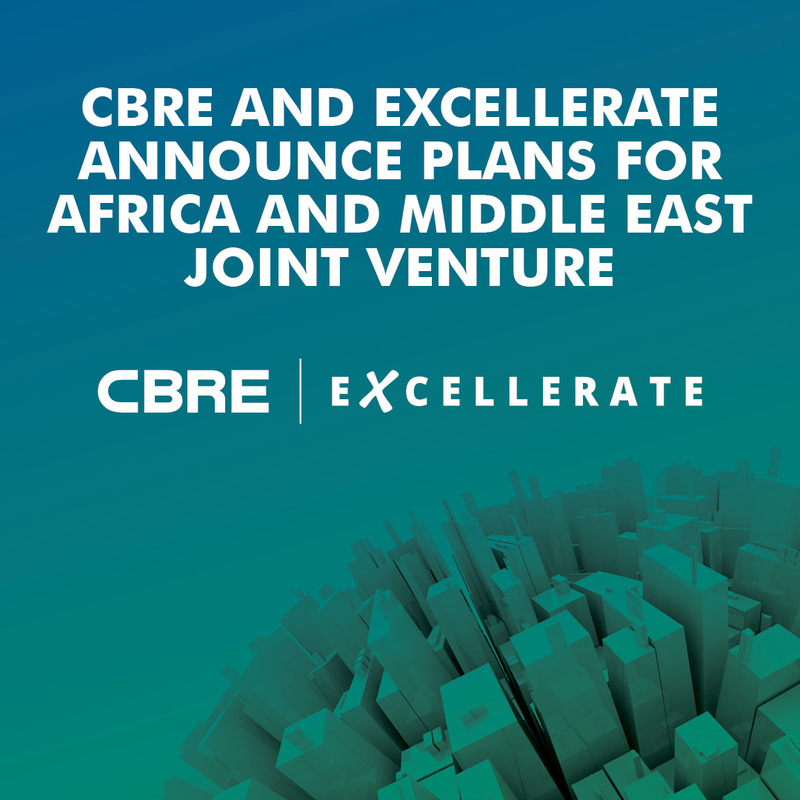 CBRE’s affiliation with Broll Property Services in South Africa, Nigeria, Ghana and Indian Ocean will also end with the formation of the CBRE Excellerate joint venture. The formation of CBRE Excellerate is subject to customary closing conditions, including government approvals, and is expected to be completed in [the first half of 2019]. Excellerate Property Services has over 24,000 employees, manages approximately $12.6 billion of asset value encompassing 14 million m² of floor space and over 21,000 leases. It is the prime retail asset manager in this region and, in South Africa, is currently rated a Level 1 BBBEE contributing group, including significant black ownership credentials. The Excellerate Property Services group also includes a significant ownership in Profica, one of Africa’s leading project management and construction management companies, which will be included in the CBRE Excellerate joint venture. The client base includes multinational corporates, public sector organisations, developers, funds, institutions and private investors. Certain of the statements in this release regarding CBRE’s intention to form a joint venture with Excellerate Property Services (Excellerate) that do not concern purely historical data are forward-looking statements within the meaning of the “safe harbor” provisions of the U.S. Private Securities Litigation Reform Act of 1995. Forward-looking statements are made based on our management’s expectations and beliefs concerning future events affecting us and are subject to uncertainties and factors relating to our operations and business environment, all of which are difficult to predict and many of which are beyond our control. Accordingly, actual performance, results and events may vary materially from those indicated in forward-looking statements, and you should not rely on forward-looking statements as predictions of future performance, results or events. Numerous factors could cause actual future performance, results and events to differ materially from those indicated in forward-looking statements, including, but not limited to, the uncertainty of government approvals, the parties’ ability to satisfy the closing conditions and consummate the joint venture transaction, the joint venture’s ability to successfully integrate its operations and employees and realize anticipated benefits as well as other risks and uncertainties discussed in our filings with the U.S. Securities and Exchange Commission (SEC). Any forward-looking statements speak only as of the date of this release. We assume no obligation to update forward-looking statements to reflect actual results, changes in assumptions or changes in other factors affecting forward-looking information, except to the extent required by applicable securities laws. If we do update one or more forward-looking statements, no inference should be drawn that we will make additional updates with respect to those or other forward-looking statements.